The subtitle of James Clough’s generously illustrated Signs of Italy: Outdoor Lettering Up and Down the Boot (Lazy Dog, €49.90; design, Bunker) might imply a travel book, a road trip around the boot-shaped terrain of the author’s adopted country. However we see little of the streetscape in favour of tightly cropped images of every kind of sign, from the sumptuously decorative (via the hilariously incompetent) to the elegantly functional, concentrating on letters made for one-off jobs rather than actual type. The signs’ materials encompass plastic, metal, stone, mosaics, ceramics and wood in a riot of letterforms. 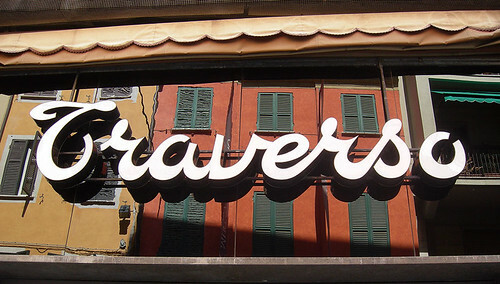 Optician’s script sign on glass in La Spezia. Top: Geometrical miniscules on a furrier’s shop in Genoa. Images from Signs of Italy aka L’Italia Insegna. The book is organised by styles, including Art Nouveau and script lettering, and by function – from cinema signs to manhole covers. One chapter deals with signs from the fascist era, including a hillside forest in the shape of the word ‘Dux’. Clough, a British designer and historian who has lived in Italy for more than 40 years, is a sharp but empathetic critic; his enthusiasm is infectious. 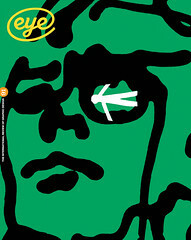 Lazy Dog has published two editions, in English and in Italian. 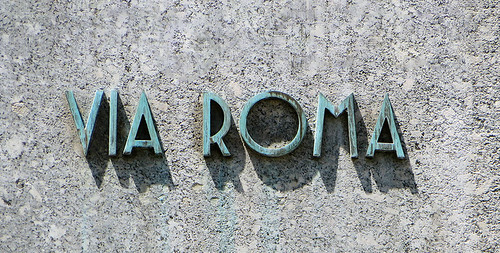 Oxidised Art Deco letters in Turin.